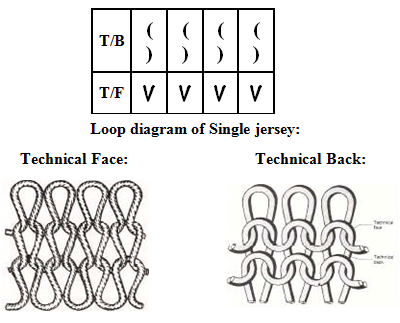 Appearance: Technical face has V shape stitch/ jersey stitch and Technical back has semi circle stitch. Semi circle stitch is also known as purl stitch because it looks like purl. Edge curling: Normally occurs T/F to T/B in lengthwise direction but sometimes occurs T/B to T/F in widthwise direction. The reason of it is yarn tension/ torque because the back needles were inactive during manufacturing. Edge curling is a disadvantage because it hampers productivity in linking section. Tension is a tightness or looseness factor of knitted structure. After knitting before linking use iron at the edges. We can also use folder or attachment during linking. Dimensional stability: Dimensional stability is comparatively poor than other knit. Dimension means shape. After stretching the fabric if it recovers to original shape dimensional stability is good and if does not recover properly stability is poor. Unraveled: We can unrope the yarn from the both end. Elasticity (stretch ability): Almost same/ equal elasticity both in lengthwise and widthwise direction. Needle head broken. So needle cannot catch the yarn and yarn loops slips. Poor quality yarn which has slub.